Cytokine-induced lung expression of the endothelial cell (EC) leukocyte receptor P-selectin initiates leukocyte rolling. To understand the early EC signaling that induces the expression, we conducted real-time digital imaging studies in lung venular capillaries. To compare receptor- vs nonreceptor-mediated effects, we infused capillaries with respectively, TNF-α and arachidonate. At concentrations adjusted to give equipotent increases in the cytosolic Ca2+, both agents increased reactive oxygen species (ROS) production and EC P-selectin expression. Blocking the cytosolic Ca2+ increases abolished ROS production; blocking ROS production abrogated P-selectin expression. TNF-α, but not arachidonate, released Ca2+ from endoplasmic stores and increased mitochondrial Ca2+. Furthermore, Ca2+ depletion abrogated TNF-α responses partially, but arachidonate responses completely. These differences in Ca2+ mobilization by TNF-α and arachidonate were reflected in spatial patterning in the capillary in that the TNF-α effects were localized at branch points, while the arachidonate effects were nonlocalized and extensive. Furthermore, mitochondrial blockers inhibited the TNF-α- but not the arachidonate-induced responses. These findings indicate that the different modes of Ca2+ mobilization determined the spatial patterning of the proinflammatory response in lung capillaries. Responses to TNF-α revealed that EC mitochondria regulate the proinflammatory process by generating ROS that activate P-selectin expression. The vast alveolar surface area of the lung potentially constitutes a portal of entry for inhaled pathogens. Although it is understood that the lung defends against this by mounting an inflammatory response as part of its well-developed innate immunity, it is puzzling as to how the response is spatially patterned in capillaries to maintain optimal conditions for gas exchange. Recruitment of capillary surface area by the inflammatory response could amount to a loss of surface area for gas exchange since the physical presence of inflammatory cells in lung capillaries, or increased capillary leak during the inflammatory response, could impede oxygen transport. The lung’s strategy for avoiding this nonbeneficial competition between defense and gas exchange functions remains unknown. Critical to the lung’s innate immunity are endothelial cells (EC)3 that institute rapid signaling by increasing the cytosolic Ca2+ (Ca2+CYT) (1, 2). In a mechanical model of the lung’s proinflammatory response in EC of lung capillaries, elevating vascular pressure increased Ca2+CYT as also expression of the leukocyte adhesion receptor, P-selectin, within minutes of the challenge (1). Notably, these responses localized at capillary branch points, suggesting the existence of a spatial strategy that spares a major part of the capillary surface during inflammatory initiation. Ca2+ mobilization leading to increase of Ca2+CYT occurs by capacitative Ca2+ entry (CCE) in which Ca2+ release from endosomal stores (ER) activates Ca2+ influx through capacitative channels in the cell membrane, or by Ca2+ entry through noncapacitative channels activated by direct agonist action (3). Ca2+ mobilization also occurs into and out of mitochondria (4, 5), raising the possibility that these organelles may have an impact on Ca2+CYT levels (4) and consequently, on downstream Ca2+CYT-dependent events relevant to proinflammatory responses. However, the mitochondrial role in inflammation remains undefined. In this study, we tested the hypothesis that in EC, differences in Ca2+ mobilization determine the extent to which mitochondria determine proinflammatory responses in lung venular capillaries. To distinguish between CCE and non-CCE, we exposed the capillaries to the prototypical inflammatory cytokine, TNF-α that causes receptor-mediated Ca2+CYT increases (6), and to the inflammatory product, arachidonate that mobilizes Ca2+ entry directly across the cell membrane by nonreceptor mechanisms (3). At equipotent Ca2+CYT increases induced by these agents, we addressed spatial profiles of mitochondrial density and mitochondrial Ca2+ (Ca2+MIT) content in EC of these capillaries. Our findings indicate that mechanisms of Ca2+ mobilization play a critical role in patterning the proinflammatory response in the lung capillary. An unexpected result was that TNF-α induced P-selectin expression by augmenting mitochondrial reactive oxygen species (ROS) production. Fluorescent probes fura 2-AM, MitoTracker Green FM (MTG), chloromethyl tetramethyl rosamine (MitoTracker Orange; MTO), rhod 2AM, and 2′,7′-dichlorofluorescin diacetate (DCFH-DA) were purchased from Molecular Probes (Eugene, OR). fura 2FF AM and 4,5 diaminofluorescein (DAF 2DA) were from TEF Labs (Austin, TX) and Calbiochem (La Jolla, CA), respectively. Mouse anti-rat P-selectin mAb RP-2 was a gift from A. C. Issekutz (Department of Microbiology-Immunology, Dalhousie University, Halifax, Canada). Goat anti-rat TNFR1 mAb E-20 was from Santa Cruz Biotechnology (Santa Cruz, CA). Alexa-Fluor 488-conjugated goat anti-mouse secondary Ab was from Molecular Probes. Agents human rTNF-α and arachidonic acid, the mitochondrial inhibitors rotenone and antimycin, the NO synthase inhibitor NG-nitro-l-arginine methyl ester (l-NAME), NO donor s-nitroso acetyl penicilamine (SNAP), the NO scavenger 2-phenyl-4,4,5,5-tetra-methyllimidazole-1-oxyl 3-oxide (PTIO), and the mitochondrial ATP-ase inhibitor oligomycin were from Sigma-Aldrich (St. Louis, MO). Mitochondrial inhibitor carbonyl cyanide p-(trifluoro methoxy) phenylhydrazone (FCCP), the Ca2+-ATPase inhibitor 2,5-ditert-butyl-hydroquinone (t-BHQ), the ionositol trisphosphate receptor blocker Xestospongin C (XeC) and the antioxidant trolox were from Calbiochem. The Ca2+ chelator BAPTA-AM was from Molecular Probes. Agents were infused into capillaries in HEPES-buffered vehicle with 4% dextran (70 kDa) and 1% FBS at pH 7.4, osmolarity 295 ± 5 milliosmoles, and containing (millimolars) 150 Na+, 5 K+, 1 Ca2+, 1 Mg2+, and 10 glucose. Preparation of the isolated blood perfused rat lungs and the imaging methods have been detailed previously (2, 7). Briefly, lungs were excised from adult male Sprague Dawley rats and continuously pump-perfused at 14 ml/min with autologous rat blood warmed to 37°C. The lungs were constantly inflated at an airway pressure of 5 cm H2O. The pulmonary artery and left atrial pressures were maintained at 10 and 5 cm H2O, respectively. The lungs were positioned on a vibration-free air table. The lung surface was kept moist with saline warmed to 37°C. A PE10 (BD Biosciences, Sparks, MD) microcatheter was introduced through the left atrial canula and wedged into the lung microcirculation. Capillary blood cell-free conditions were established by flushing with HEPES-buffered Ringer’s solution. The agents were infused at the following concentrations: rhod 2AM 5 μM, MTG FM 1 μM, MTO 2.5 μM, fura 2AM 10 μM, DCFH-DA 2.5 μM, DAF 2DA 2 μM, TNF-α 40–200 ng/ml, arachidonate 2–10 μM, saponin 0.01%, antimycin 1 μg/ml, FCCP 400 nM–1 μM, oligomycin 2.5 μg/ml, rotenone 1 μM, BAPTA AM 40 μM, t-BHQ 15 μM, XeC 20 μM, trolox 2 mM, l-NAME 10 μM, PTIO 100 μM, and SNAP 500 μM. FCCP was always infused with oligomycin, to prevent ATP depletion by the mitochondrial ATPase (8). To establish Ca2+-free conditions, capillaries were flushed for 10 min with Ca2+-free HEPES-buffered Ringer’s containing 0.5 mM EGTA. Although the only cell type in these capillaries are EC (7), fluorophores may leak across the capillary wall to enter cells such as epithelial cells of adjacent alveoli. Fluorophores may also enter cells in the bloodstream such as leukocytes and platelets. We protected against these potential artifacts by maintaining absorptive conditions within the capillary (9) and by clearing the capillaries of blood before dye infusion. Fluorophores were excited using mercury arc lamp illumination directed through appropriate interference filters (XB58/25R and XB62/25R; Omega Optical, Brattleboro, VT) and filter sets (71000, 41001, and 41004; Chroma Technology, Brattleboro, VT). Fluorophore exposures were controlled by a filter wheel (LAMBDA10-2; Sutter Instrument, Novato, CA). The fluorescence emission was collected using an objective lens (LUMPlanFL ×40/0.8W; Olympus Optical, Melville, NY), passed through an image intensifier (Midnight Sun; Imaging Research, St. Catharine’s, Canada), and captured with a charge-coupled device camera (CCD-72; Dage-MTI, Michigan City, IN). The images were then recorded and subject to image analysis (MCID5.0; Imaging Research). Confocal images were obtained using a LSM5-Pascal (Zeiss, Thornwood, NY) confocal imaging system attached to an Axiophot (Zeiss) microscope. Fluorophores were excited using a He-Ne Laser (545 nm) and an Argon laser (492 nm). Emitted fluorescence was collected using objective lens (Achroplan ×40/0.8W, Achroplan ×63/1.2W; Zeiss). The images were recorded and analyzed using Pascal (Zeiss). To detect Ca2+MIT, we infused rhod 2AM into capillaries for 20 min followed by a Ringer’s flush for 30 min. A capillary was excited at 545 nm and the fluorescence emissions recorded at 560 nm. Capillary Ca2+CYT was determined as described previously (7). Briefly, capillaries were loaded with fura 2-AM for 30 min and then excited at 340 and 380 nm. The fluorescence emissions at 510 nm were recorded and Ca2+CYT calculated from a computer-generated 340:380 emissions ratio. ER Ca2+ was determined by fura 2FF using a protocol similar to that used for fura 2. To detect EC ROS and NO production, DCFH-DA and DAF 2DA, respectively, were continuously infused into capillaries. Image acquisitions were started 30 min after the start of fluorophore infusion. Capillaries were excited at 490 nm and the emission at 510 nm was recorded. Changes in capillary fluorescence were quantified in a 4-μm2 area along the capillary wall. To determine EC P-selectin expression, we infused RP-2 (3.5 μg/ml) into the capillary for 3 min, followed by the secondary AlexaFluor-488-conjugated Ab (2 μg/ml) for 2 min. Unbound fluorescence was removed by flushing for 1 min with Ringer’s solution. Residual capillary fluorescence was recorded and changes in global fluorescence were reported as changes in P-selectin expression. All data are reported as mean ± SE. Paired observations were compared using paired Student’s t test and grouped differences were compared with ANOVA (Newman-Keuls test). To determine mitochondrial density in lung EC in situ, we infused venular capillaries with the mitochondria-sensitive dyes, MTG, MTO, and rhod 2. MTG and MTO localize to mitochondria by binding to the inner membrane (10), while rhod 2, which is Ca2+ sensing, distributes by charge to the anionic mitochondrial matrix (8). Real-time confocal microscopy at high magnification revealed EC mitochondria as clumped fluorescence aggregates of diameter 0.5–1 μm that were organized along the cell periphery (Fig. 1⇓A) (10, 11). Viewed at lower magnification, the dyes appeared colocalized in the capillary wall and were most dominantly fluorescent in EC located at capillary branch points (Fig. 1⇓, B–D). Quantified over equal lengths of vessel wall, MTG fluorescence was more than two times higher at branch points than at midsegments (Fig. 1⇓E). Real-time confocal microscopy of EC mitochondria in lung venular capillaries. High power view of an EC (A) showing clumped (arrow) fluorescence of MTO. Dashed line indicates vessel margin. Images of a capillary show fluorescence of MTG (B) and rhod 2 (C) separately and superimposed (D). Arrow shows blood flow direction. Branch point (white arrowhead) and midsegmental locations (yellow arrowhead) are indicated. Replicated four times. E, Indicated fluorescence quantifications were obtained in a 4-μm2 window placed over capillary images. Mean ± SE; n = 4 experiments. ∗, p < 0.05 compared with branch point. To determine the extent of cytosolic uptake, we compared rhod 2 fluorescence against that of the Ca2+CYT indicator, fura 2. The membrane-permeabilizing agent saponin (2) transiently increased the fura 340:380 ratio (Fig. 2⇓A) as well as rhod 2 fluorescence (Fig. 2⇓B), indicating that permeabilization increased Ca2+ influx into the cytosol. Subsequently, while the 340:380 ratio decreased to zero, rhod 2 fluorescence returned to baseline and remained steady, indicating that although membrane permeabilization eliminated fura 2 that localized to the cytosol, rhod 2 was not eliminated because it was compartmentalized to mitochondria and not the cytosol. 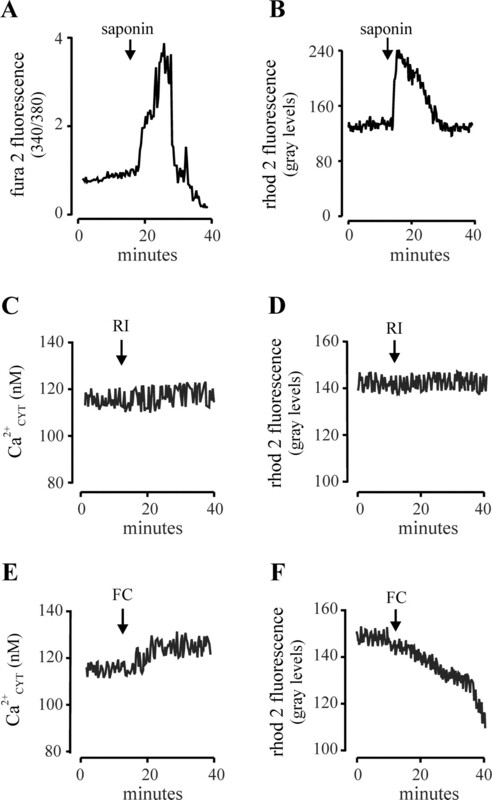 Time-dependent changes in Ca2+-sensitive fluorescence in EC of lung capillaries. Traces show responses to Ca2+CYT (A, C, and E) and Ca2+MIT (B, D, and F). Saponin, 0.01%; RI, Ringer’s solution; FC, FCCP (1 μM). Replicated three times. Baseline fluorescence for each fluorophore was stable for up to 40 min (Fig. 2⇑, C and D). To inhibit Ca2+MIT uptake, we infused FCCP that uncouples oxidative phosphorylation (4, 8, 12). FCCP decreased rhod 2 fluorescence, while causing a small increase in Ca2+CYT (Fig. 2⇑, E and F). 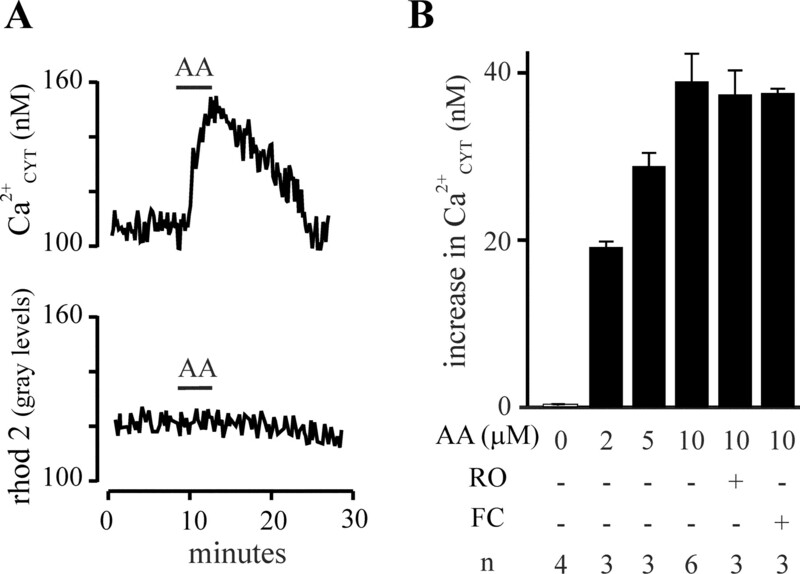 These responses indicate that with inhibition of Ca2+ uptake in mitochondria Ca2+MIT export predominated and accounted for a small Ca2+ increase in the cytosol. These responses affirmed that rhod 2 fluorescence reflects Ca2+MIT dynamics (4, 8). TNF-α increased Ca2+CYT and Ca2+MIT in a concentration-dependent manner (Fig. 3⇓, A–C). FCCP blocked the Ca2+MIT but not the Ca2+CYT response (Fig. 3⇓D). However, rotenone that is not expected to affect mitochondrial or Ca2+CYT in the short term had no effect on either (Fig. 3⇓D). Arachidonate also caused concentration-dependent Ca2+CYT increases, but in contrast to TNF-α, it did not increase Ca2+MIT (Fig. 4⇓). Not shown are our determinations in which we confirmed the absence of pericapillary edema formation that is evident as interstitial widening and loss of image quality, or alterations in blood flow following infusions of TNF-α and arachidonate. Hence, neither agent caused detectable capillary damage. Ca2+CYT and Ca2+MIT responses to TNF-α. A, Traces are responses to infusions of TNF-α (200 ng/ml) (bars = 5 min). B and C, Dose-dependent responses with respect to baseline. ∗, p < 0.05 compared with 0 ng/ml. D, Differential inhibitory effects to FCCP (FC; 400 nM), and rotenone (RO; 1 μM). Mean ± SE. ∗, p < 0.05 compared with response without inhibitor. Ca2+CYT responses to arachidonate. AA, arachidonate. A, Traces represent changes in Ca2+CYT (top panel) and rhod 2 fluorescence (bottom panel) in response to infusions of AA (10 μM). B, Dose responses and the effect of mitochondrial blockers rotenone (RO; 1 μM) and FCCP (FC; 1 μM) on AA-induced Ca2+CYT responses. To characterize these Ca2+ responses further, we considered CCE mechanisms. Two agents that inhibit Ca2+ release from ER, namely XeC that inhibits InsP3 receptors (13) and t-BHQ that depletes the stores by blocking ER Ca2+-ATPase (12, 14), inhibited the TNF-α-induced Ca2+MIT and Ca2+CYT responses (Fig. 5⇓A). However, neither agent blocked the arachidonate-induced Ca2+CYT increase (Fig. 5⇓B). Furthermore, capillary infusions of Ca2+-depleted buffer blocked the Ca2+CYT increase to TNF-α by 40% (p < 0.05), while that to arachidonate was blocked completely (Fig. 5⇓C). In affirmation of previous reports (6, 15), these findings indicate that the TNF-α-induced Ca2+CYT increases resulted from CCE, while the arachidonate-induced ones resulted entirely from non-CCE (5). Ca2+CYT and Ca2+MIT responses to inhibitors of Ca2+ mobilization. Responses are shown to TNF-α (TNF; 200 ng/ml) (A), arachidonate (AA; 10 μM) (B), and capillary infusions of a Ca2+-depleted Ringer’s (Ringer’s containing 0.5 mM EGTA) (C). TB, tertbutylhydroquinone (15 μM); XE, XeC (20 μM). Mean ± SE; ∗, p < 0.05 compared with responses obtained in the presence of Ca2+-containing Ringer’s. Because pharmacological inhibitors may have nonspecific effects, we determined store release by quantifying the fluorescence of the cell permeable dye fura 2FF, a low Ca2+ affinity derivative of fura 2 that localizes to the Ca2+-rich ER compartment (16). At baseline, fura 2FF fluorescence was spatially nonuniform being most prominent at branch points and almost nonevident at midsegmental locations (Fig. 6⇓A), indicating that EC containing high density of Ca2+ stores were distributed nonuniformly in the capillary. The fluorescence was steady for up to 30 min under baseline conditions. 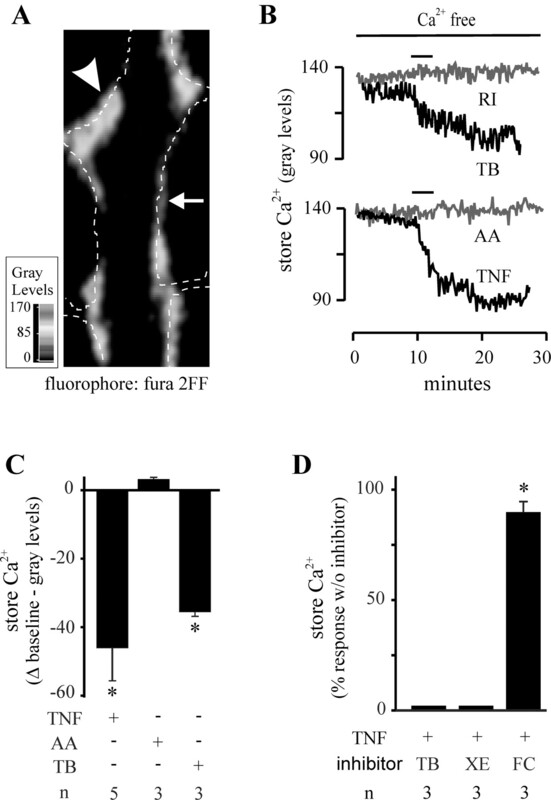 However, the Ca2+-ATPase inhibitor t-BHQ that depletes ER Ca2+ induced the expected reduction of fura 2FF fluorescence under Ca2+-free conditions (Fig. 6⇓, B and C). The fluorescence was unaffected by FCCP (data not shown), thereby ruling out mitochondria as a source of the fluorescence. These results affirmed fura 2FF fluorescence as reflecting ER Ca2+ levels (16). Ca2+ levels in endothelial stores of lung capillaries. A, Distribution of fura 2 FF in a capillary under baseline conditions (diameter: 20 μm). Intensity code indicates gray levels. Dashed lines indicate vessel margins. A branch point (arrowhead) and a midsegmental (arrow) location are indicated. B, Tracings from single experiment indicate changes in fura 2FF fluorescence at a branch-point location. Infusions given as indicated (bar). Replicated three times. C and D, Group data show decreases in fluorescence from baseline and responses to inhibitors. RI, Ringer’s solution; TB, tertbutylhydroquinone (t-BHQ, 15 μM); AA, arachidonate (10 μM); TNF, TNF-α (200 ng/ml); XE, XeC (20 μM); FC, FCCP (1 μM). Mean ± SE. n = number of experiments. ∗, p < 0.05 compared with baseline. TNF-α decreased fura 2FF fluorescence, but arachidonate had no effect (Fig. 6⇑, B and C). The TNF-α-induced response was abolished in the presence of both t-BHQ and XeC (Fig. 6⇑D). However, FCCP did not affect these responses (Fig. 6⇑D). These findings indicate that TNF-α, but not arachidonate, caused store depletion of Ca2+ that was mediated by InsP3 and that was independent of Ca2+MIT uptake. To determine whether these Ca2+ responses induced EC ROS production, we infused DCFH-DA that intracellularly de-esterifies to DCFH, the substrate that ROS oxidize to fluorescent 2′,7′-dichlorofluorescein (DCF) (17). Weak fluorescence at baseline (Fig. 7⇓A) indicated that ROS production was low under resting conditions. Both TNF-α and arachidonate increased DCF fluorescence rapidly (Fig. 7⇓, B–D). For TNF-α, the fluorescence increases were inhibited by preinfusion of mAb E-20 that ligates TNFR1 on EC (2), but not by the nonspecific mAb, RP2 (Fig. 7⇓E). Hence, these responses resulted from ligation of TNFR1 expressed on EC in these capillaries. Infusions of catalase that hydrolyzes extracellular H2O2 failed to modify the DCF responses (data not shown), indicating that the fluorescence increases in EC were not attributable to entry of external H2O2. For both TNF-α and arachidonate, the responses occurred in a concentration-dependent manner (Fig. 7⇓F). However, the responses differed in that the TNF-α effect localized predominantly at branch points, while the arachidonate effect was both more intense and more extensive along the capillary length (Fig. 7⇓, B, C, and G). ROS production in lung capillaries. Capillaries were infused with vehicle (baseline), TNF-α (TNF; 200 ng/ml), arachidonate (AA; 10 μM), trolox (TR; 2 mM). Mean ± SE. A–C, Images of single capillaries show DCF fluorescence. Intensity code indicates fluorescence levels. Dashed lines indicate vessel margins. Branch point (arrowhead) and midsegmental (arrow) locations are indicated. Note fluorescence increase is uneven for TNF-α, but extensive for arachidonate. Replicated six times. D and E, Traces from single experiments show time courses of increase in DCF fluorescence. Agents were infused for durations indicated (bars) in the absence (D) and presence (E) of mAbs E-20 (10 μg/ml) and RP-2 (3.5 μg/ml). F, Concentration-dependent responses. ∗, p < 0.05 against highest concentration. G, ROS production at different capillary locations. ∗, p < 0.05 compared with branch-point. n = 5 capillaries. The antioxidant trolox (Fig. 8⇓A) blocked increases of DCF fluorescence to both TNF-α and arachidonate, indicating that the responses were attributable to ROS production. After washing out trolox, an infusion of H2O2 elicited increase of DCF fluorescence (data not shown), indicating that the inhibitory responses to trolox were not attributable to DCF quenching, or to DCF leakage from EC. Trolox did not affect Ca2+CYT increases induced by TNF-α or arachidonate, thereby ruling out the possibility that its inhibitory effects resulted from blockade of these Ca2+CYT responses (Fig. 8⇓B). Inhibition of ROS production. Effects of the antioxidant trolox (TR) are shown on ROS production (A) and increases in Ca2+CYT and Ca2+MIT (B) by TNF-α (TNF; 200 ng/ml) and arachidonate (AA; 10 μM). ∗, p < 0.05 compared with responses without TR. C, TNF-α- and arachidonate-induced ROS responses in the presence of mitochondrial inhibitors rotenone (RO; 1 μM), FCCP (FC; 1 μM), and antimycin (AN; 1 μg/ml). ∗, p < 0.05 compared with responses without inhibitor. Mean ± SE. n = number of experiments. The mitochondrial blockers rotenone and FCCP each blocked the DCF fluorescence increase to TNF-α, but not that to arachidonate (Fig. 8⇑C). Antimycin that is expected to increase mitochondrial ROS production by inhibiting complex III (17, 18) augmented the fluorescence increase to TNF-α (Fig. 8⇑C) although it caused no increase of DCF fluorescence at baseline or after arachidonate. These findings indicate that increase of DCF fluorescence to TNF-α, but not to arachidonate, was attributable to induction of ROS of mitochondrial origin. The inability of the mitochondrial blockers to inhibit the arachidonate-induced increase of DCF fluorescence ruled out not only any involvement of mitochondria in the arachidonate effect, but also the possibility that there was nonspecific reduction of DCF fluorescence. Because TNF-α induces NO release (19) and NO may oxidize DCFH to increase DCF fluorescence (20), we considered potential effects of NO in these experiments. 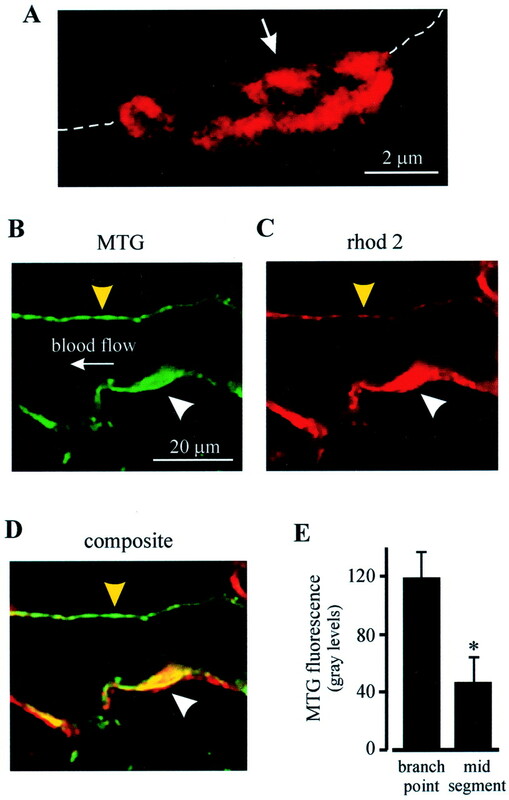 In capillaries loaded with the NO-sensitive fluorophore, DAF 2, both the NO donor SNAP and TNF-α caused concentration-dependent fluorescence increases, affirming our ability to detect NO in these capillaries (Fig. 9⇓). As expected, the e-NO synthase inhibitor l-NAME completely abolished the TNF-α-induced, but not the SNAP-induced, responses (Fig. 9⇓). However, l-NAME did not inhibit TNF-α-induced DCF responses (Fig. 9⇓C), thereby ruling out an NO effect on TNF-α-induced ROS production. Furthermore, the NO scavenger, PTIO (21), also failed to have any effect on TNF-α’s DCF response (Fig. 9⇓C). These findings taken together with the complete inhibition of the DCF response by trolox (Fig. 8⇑A) indicate that the increase of DCF fluorescence was attributable entirely to ROS production. NO production in EC of lung capillaries. A, Traces show representative responses of NO indicator, DAF2 to SNAP (SN) (top panels) and TNF-α (TNF) (bottom panels) (each response replicated three times). Concentrations of SNAP and TNF-α as indicated on traces were infused for the durations indicated (bars) in the absence or presence of l-NAME (LN; 100 μM). Bars show DAF2 (B) and ROS (C) responses as mean ± SE for three experiments each. ∗, p < 0.05, significantly different from baseline. Concentrations in C and D are: SN (100 μM); TNF (200 ng/ml); arachidonate (AA; 10 μM); ln (100 μM); PTIO (PT; 100 μM). Both TNF-α and arachidonate markedly increased P-selectin expression on the EC lining of these capillaries (Fig. 10⇓, A–C). However, the fluorescence increases were patchy for TNF-α, but considerably more uniform for arachidonate. For both agents, trolox blocked the response (Fig. 10⇓D), indicating that ROS determined the P-selectin expression. Rotenone and FCCP blocked the TNF-α-induced P-selectin expression (Fig. 10⇓D), indicating that mitochondrial mechanisms were also responsible for this effect. In contrast, the arachidonate-induced expression was unaffected by mitochondrial blockers (Fig. 10⇓D), indicating first the noninvolvement of mitochondria in this response and second the absence of nonspecific inhibition of P-selectin expression by these blockers. These responses indicated that the TNF-α- but not arachidonate-induced exocytosis of P-selectin occurred through mitochondrial mechanisms. P-selectin expression in lung capillaries. A–C, Images show residual fluorescence of a capillary infused with a P-selectin Ab (RP-2; 3.5 μg/ml) followed by an Alexa Fluor-488-conjugated secondary Ab (2 μg/ml). Panels show capillary fluorescence in response to infusions of vehicle (A), TNF-α (TNF; 200 ng/ml) (B), and arachidonate (AA; 10 μM) (C). Intensity code indicates gray levels. Dashed lines indicate capillary margins. Branch point (arrowhead) and midsegmental (arrow) capillary locations are indicated. Replicated seven times. D, Responses are fluorescence increases above that of vehicle-infused capillaries (baseline). Agonist responses were paired. TNF, 200 ng/ml; AA, 10 μM; rotenone (RO; 1 μM); FCCP (FC; 1 μM); trolox (TR; 2 mM); infusion of secondary Ab (2y; 2 μg/ml) alone. ∗, p < 0.05 compared with responses without inhibitors. Mean ± SE. n = number of experiments. To further characterize Ca2+-dependent mechanisms, we blocked Ca2+ changes by either chelating Ca2+CYT with BAPTA or by infusing a Ca2+-depleted buffer. BAPTA completely inhibited both TNF-α- and arachidonate-induced ROS production and P-selectin expression (Fig. 11⇓), indicating that the response was Ca2+CYT-dependent for both agents. 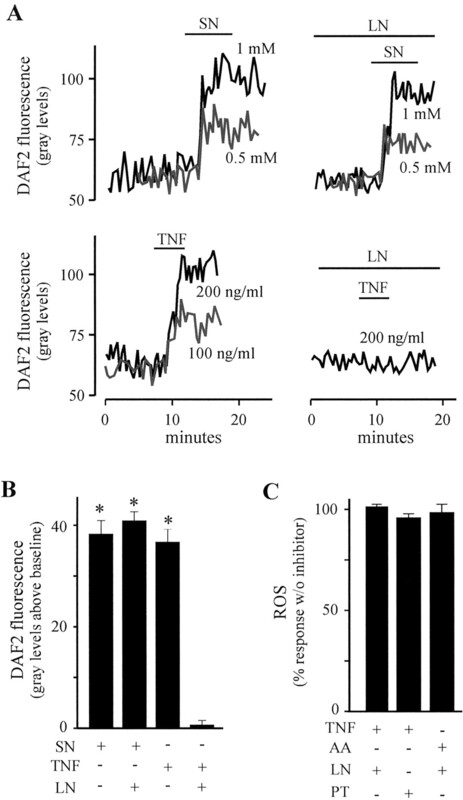 However, infusion of Ca2+-depleted buffer only partially inhibited the TNF-α-induced ROS and P-selectin responses, but completely inhibited the arachidonate-induced responses (Fig. 11⇓), indicating that the latter responses were entirely dependent on entry of external Ca2+. Effects of inhibiting Ca2+ mobilization in EC of lung capillaries. 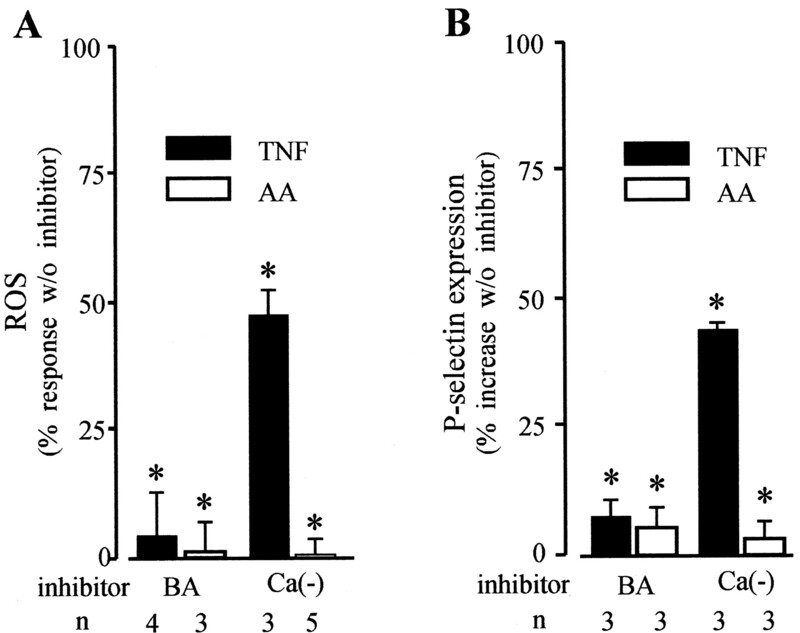 Effects of TNF-α (TNF; 200 ng/ml) and arachidonate (AA; 10 μM) on ROS (A) and P-selectin expression (B) in the presence of infusions of the Ca2+-chelator BAPTA (BA; 40 μM) and of Ca2+-depleted Ringer’s solution containing 0.5 mM EGTA (Ca(−)). Mean ± SE. ∗, p < 0.05 compared with responses without inhibitors. n = number of capillaries. We determined the sequence of proinflammatory signaling in EC of lung venular capillaries using TNF-α and arachidonate as inflammatory agonists and P-selectin expression as a marker of the proinflammatory response. Both agonists rapidly increased Ca2+CYT, while also increasing ROS production and P-selectin expression. For both, inhibiting the Ca2+CYT increase by intracellular Ca2+ chelation with BAPTA, or by infusion of Ca2+-depleted buffer, blocked P-selectin expression. This affirms the widely held view that an increase of Ca2+CYT constitutes the critical signaling event proximal to P-selectin expression (reviewed in Ref. 2). However, our new results redefine this thinking. Thus, blocking the Ca2+CYT increase blocked the ROS response, and blocking the ROS response blocked P-selectin expression. These findings, which were common to both agonists, indicate that an increase of Ca2+CYT was not itself sufficient to induce P-selectin expression and that downstream induction of ROS was required. To our knowledge, this is the first evidence that places Ca2+CYT-induced ROS in the intracellular signaling pathway underlying the expression of P-selectin. The TNF-α-induced ROS were of mitochondrial origin, as indicated by several findings. TNF-α increased Ca2+MIT, a known stimulator of mitochondrial ROS production (22). FCCP inhibited both the Ca2+MIT increase as also the induced ROS production, thereby implicating Ca2+MIT directly in the induction of the ROS. Rotenone also inhibited the TNF-α-induced ROS increase, while antimycin enhanced it. Because these blockers did not inhibit the concomitant Ca2+CYT increases, we may rule out the possibility that the inhibitions were due to nonspecific effects of the blockers. Previous reports have implicated mitochondria (6, 23), NADPH oxidase (24), and cPLA2 (25) in TNF-α-induced ROS production in EC. However, in this study the TNF-α-induced ROS originated exclusively from mitochondria as indicated by the inhibitory effects of the mitochondrial blockers. Rotenone and FCCP both also inhibited P-selectin expression. Hence, for the first time, these findings implicate EC mitochondria as initiators of the proinflammatory response in these capillaries. We considered the possibility that the increase of DCF fluorescence resulted from diffusion of H2O2 into EC from nonspecific extracellular sources. However, infusion of the anti-TNFR1 mAb, E-20 (2), blocked the TNF-α-induced ROS production, indicating not only that the effect was receptor-mediated, but also that the DCF response was entirely attributable to ROS production in EC. Moreover, catalase that hydrolyzes extracellular H2O2 did not block the TNF-α-induced response, hence H2O2 originating from a source external to EC was not a factor in these responses. Mitochondrial ROS production may be pathologic, since it abolishes the mitochondrial potential, leading to release of cytochrome c and apoptosis (18, 26). However, to the extent that we could determine, the present levels of ROS were not cytotoxic since we detected neither mitochondrial damage (Fig. 3⇑A), nor damage to the cell membrane that would have been evident in loss of cell fluorescence resulting from leakage of intracellular fluorescent indicators such as fura 2. Furthermore, the responses returned to baseline levels after transient increases to TNF-α in the poststimulus period and they could be repeated in the same capillary. These considerations indicate that the present TNF-α-induced mitochondrial ROS production was a constitutive, not a pathologic, feature of cell signaling. The mechanisms by which ROS induced exocytosis are not clear. One possibility is that diffusible ROS, such as H2O2, inhibits cytosolic tyrosine phosphatases (27) to activate tyrosine kinases of the Src family (28) that may regulate exocytosis. Tyrosine kinases are implicated in some forms of secretion as in neutrophils in which secretion is blocked by the broad-spectrum tyrosine kinase inhibitor, genistein, as well as by PP1, an inhibitor of Src family kinases (29). Moreover, secretion is attenuated in mice deficient in Src family kinases (29), and the tyrosine kinase, Syk, plays a pivotal role in high-affinity IgE receptor-induced secretion in mast cells and basophils (30). The extent to which these mechanisms applied to the present findings requires further consideration. Arachidonate, as different from TNF-α, used nonmitochondrial mechanisms for ROS production. This was evident in that arachidonate had no effect on Ca2+MIT and that mitochondrial blockers failed to inhibit the arachidonate-induced ROS response. Although we did not identify the source, in neutrophils and eosinophils arachidonate-induced ROS production occurs through activation of NADPH oxidase in the plasma membrane (31, 32). It is proposed that influx of external Ca2+ primes NADPH oxidase (33). Our findings are consistent with these mechanisms in that depleting external Ca2+ completely inhibited the arachidonate-induced ROS production, supporting the notion that Ca2+ entry is critical for this response. At concentrations that induced equipotent Ca2+CYT increases (Fig. 3⇑A), TNF-α and arachidonate activated distinctly different mechanisms of Ca2+ mobilization. First, TNF-α but not arachidonate reduced the fluorescence of fura 2FF. This TNF-α effect was abolished by blocking ER Ca2+ release, consistent with the notion that TNF-α causes InsP3-dependent Ca2+ release from ER (6, 15). Second, TNF-α but not arachidonate increased Ca2+MIT. These results suggest that ER Ca2+ release was critical for the Ca2+MIT increase in support of the view that the spatial proximity of ER and mitochondria facilitates Ca2+ mobilization between these compartments (34). Third, depletion of external Ca2+ blocked the Ca2+CYT response to TNF-α only partially, but that to arachidonate completely. We interpret from these findings that store depletion followed by CCE accounted for the TNF-α-induced Ca2+CYT increases, while those for arachidonate were entirely attributable to influx of external Ca2+. Mitochondria regulate Ca2+CYT by both importing and exporting Ca2+ across the inner membrane by means of a uniporter and a Na+/Ca2+ exchanger, respectively (5, 35). In several cell types (35, 36), the net effect is to buffer increases in Ca2+CYT and thereby, negatively regulate aspects of Ca2+CYT-dependent cell function, as for example, catecholamine secretion in chromaffin cells (36). Mitochondrial buffering is revealed by inhibiting Ca2+MIT uptake that augments induced Ca2+CYT increases (5, 35, 36). By contrast, in our experiments, blockade of Ca2+MIT uptake by FCCP did not modify concomitant TNF-α-induced Ca2+CYT increases, indicating the absence of a detectable mitochondrial buffering effect. The ER and mitochondrial distributions were regionally coupled in these capillaries in that fluorescence for both localized dominantly at branch point EC. TNF-α’s effects being mitochondria-dependent localized to branch point EC. However, arachidonate’s effects being mitochondria-independent were not subject to similar spatial constraints. Evidently, EC mitochondrial density spatially patterned the capillary’s proinflammatory response to TNF-α. Although both arachidonate and TNF-α induced Ca2+ influx, nonmitochondrial ROS were activated by external Ca2+ entry attributable to arachidonate, but not by the influx resulting from TNF-α-induced CCE. This differential response indicates that signaling pathways to ROS production are partitioned by not just an increase of Ca2+CYT, but by the mechanism of Ca2+ mobilization. Two classes of Ca2+-dependent agonists may exist, namely those that recruit ER-mitochondrial mechanisms, and those that favor direct Ca2+ entry, as exemplified in this study by TNF-α and arachidonate, respectively. However, the extent to which these separate strategies of Ca2+ mobilization, hence of spatial patterning, apply to other inflammatory agonists requires further consideration. Our finding that TNF-α causes P-selectin expression in lung venular capillaries is similar to the TNF-α response in systemic venules (37). In addition, TNF-α increases P-selectin expression in human pulmonary microvascular EC (38) and in HUVEC (39), but not in human pulmonary artery or dermal EC (38). Our findings together with these reports, indicate that in lung, TNF-α-induced P-selectin expression may be restricted to microvascular EC (38) and that the expression may be an early event that is not detectable after several hours of TNF-α exposure (40). In EC derived from large vessels, TNF-α exposure for several hours causes expression of E-selectin and ICAM-1 by inducing ROS-mediated increase in gene expression of these molecules (41, 42). Taking these findings together with ours, we suggest that TNF-α-induced ROS enable EC expressions of different leukocyte adhesion receptors in a time-dependent manner, such that P-selectin exocytosis occurs immediately, while E-selectin and ICAM-1 expressions are induced at later time points. In conclusion, our findings with TNF-α reveal the new insight that in EC, mitochondrial ROS may act as diffusible messengers to induce proinflammatory signaling. Previously, mitochondrial ROS have been implicated in signaling related to gene transcription (43), hypoxic pulmonary vasoconstriction (44), insulin secretion (45), and platelet aggregation (46). The present branch point dominant proinflammatory response to TNF-α may reflect a mechanism that protects capillary midsegments from deleterious inflammatory effects that could interfere with gas exchange and reduce blood flow. By contrast, the spatially extensive effects of arachidonate may exemplify the pattern of a more fulminant response. These considerations may be relevant to understanding the extent to which the spatial profile of vascular inflammation determines lung injury. ↵1 This work was supported by National Institutes of Health Grants HL57556, HL36024, HL64896, and HL69514 (to J.B.). ↵3 Abbreviations used in this paper: EC, endothelial cell; ROS, reactive oxygen species; Ca2+CYT, cytosolic Ca2+; CCE, capacitative Ca2+ entry; ER, endosomal store; Ca2+MIT, mitochondrial Ca2+; MTG, MitoTracker Green FM; DCF, 2′,7′-dichlorofluorescein; MTO, MitoTracker Orange; DCFH-DA, DCF diacetate; DAF 2DA, 4,5 diaminofluorescein; l-NAME, NG-nitro-l-arginine methyl ester; SNAP, s-nitroso acetyl penicilamine; PTIO, 2-phenyl-4,4,5,5-tetra-methyllimidazole-1-oxyl 3-oxide; FCCP, carbonyl cyanide p-(trifluoro methoxy) phenylhydrazone; t-BHQ, 2,5-ditert-butyl-hydroquinone; XeC, Xestospongin C.